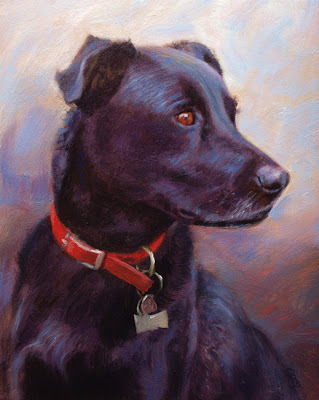 This is another commissioned dog portrait. I love dogs and we've been pretty lonesome since losing Pablo, our great little Beagle cross, last fall. It's been fun doing these portraits, since I feel I get to know the dog while I'm painting them, even if it's just from photos. In the case of Sammy I had the good fortune to meet him, which helped a lot. I'll be gone over the weekend and plan to be back Monday with another post. Have a great weekend, everyone. Very nice. I like how you countered all of that cool fur and reflected light on it with the warmer bits. You did a great job with his expression. What a wonderful portrait! I had a dog like this once (a Lab mix), and that look of intelligence and inquiry makes me think of Miranda! I'm sorry about Pablo. I lost my 16-year-old Cleo a few years ago, and still think of--and look for--her every time I pass one of her favorite spots. Thanks, Laura. Yes, we get awfully attached to these pooches, don't we? I wish dogs had longer lifespans.